Already we see the usual suspects trying to turn the Mumbai attack as a pretext for a civilisational war they'd never turn upto. The kind of people who love sending other people's kids to fight a war, but would never dream of sending their own. On a small islet off the coast of Mumbai lies a whitewashed monument that attracts tourists and locals. Here, the patron saint of Mumbai is believed to be buried. Known to his devotees as Haji Ali, this wealthy 15th century Muslim merchant is said to have renounced his riches and devoted his life to worship and service to the poor. Ali died in Mecca while performing the Haj pilgrimage which millions of Muslims are about to perform. Local legend has it that his casket drifted and settled at the site of the present tomb and mosque. A narrow walkway approximately 1km in length and linking the shrine to the rest of Mumbai easily becomes immersed in water. Hence the shrine can be accessed only during low tide. 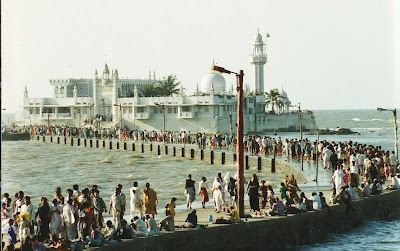 At high tide, this landmark of Mumbai, as sacred to Hindus and Sikhs as it is to Muslims, appears to be floating on water. Bollywood tragedies frequently show distraught characters drowning sorrows in the rhythmic devotion of traditional Indian Sufi qawwali music at the tomb of a Muslim saint. Across India, people of all faiths and castes and creeds visit the shrines of saints who taught the message of divine love made available to all. And it's likely that, following the past few days of terror for the people of Mumbai, the crowd of distressed devotees seeking solace at Piya Haji Ali's shrine will be much larger. People from across the Indian faith and cultural spectrum - Hindus of all castes, Muslim of various ethnic groups and denominations, Parsees, Jains, Sikhs, Christians, indigenous Beni Israel and Baghdadi Indian Jews and other combinations of belief or lack thereof - have made Mumbai their home for centuries. However, dark forces of intolerance have haunted this city where in previous centuries people used the universal language of trade to overlook if not overcome their differences. Hemant Karkare, the Anti-Terrorist Squad (ATS) chief in Mumbai's Maharashtra state, was gunned down with two of his colleagues by Muslim extremists on Day 1 of the terror attack. Ironically, Karkare had earlier received death threats from extremist followers of Hindutva theocratic politics similar to that which inspired the assassins of Mahatma Gandhi. Karkare, himself a Hindu, had recently launched an investigation into a Hindutva cell, uncovering evidence that implicated senior supporters of the pro-Hindutva BJP Opposition as well as senior members of India's military. ... wanted to make India like what it was when it was ruled by the Aryans. Evidence of this wider plan was found on one detainee's laptop. ... acting in a politically motivated and unprofessional manner. On the first day of the Mumbai terrorist strike, the Indian Express reported BJP President Rajnath Singh accusing Karkare's anti-terrorist squad of "harassment and humiliation" of Hindutva terror suspects. Yet many BJP leaders have watched silently while their members orchestrated atrocities against religious minorities. Those perpetrating the 2002 Gujarat pogrom of Muslims, which led to at least 2000 deaths, have not been brought to justice. Among them is Gujarat Chief Minister Narendra Modi, who was refused a visa to enter the United States for his role in the slaughter. Activists of the Vishwa Hindu Parishad (VHP), part of the BJP opposition, have in recent months terrorised Indian Catholic communities and institutions. The VHP regards Semitic faiths such as Christianity as foreign faiths, despite their presence in India for at least a millennium. In August, a senior VHP leader was murdered in the eastern state of Orissa. Maoist rebels claimed responsibility, but this didn't stop VHP terrorists from going on the rampage against local Catholics and their institutions. Churches and other Christian institutions (including those linked to the order of the late Mother Teresa) were destroyed. Christian homes were burned and Christians fled into surrounding jungles. Nuns were raped and burned alive. The fact of the matter is you have Hindus who are terrorists. You have Muslims who are terrorists. You also have Christians who are terrorists. [S]everal other denominations that have proven their capacity for terrorism. We must realise that terrorism is simply a method by which civilians are intentionally targeted. That's it. Of course, the vast majority of Indians have no tolerance for such extremes. Mumbaiyan Hindus joined Mumbaiyans of other faiths in paying tribute to Karkare who received a state funeral on Saturday. And no doubt tens of thousands more will seek solace at the tomb of Mumbai's patron saint Haji Ali. * Irfan Yusuf is a Sydney lawyer and associate editor of AltMuslim.com. This article was first published in the NZ Herald on Tuesday 2 December 2008. UPDATE I: How's this for a reasoned rebuttal? UPDATE II: Here is a balanced and completely unbiased letter to the editor published in the New Zealand Herald on 5 December 2008. In the aftermath of the Mumbai massacre, the Herald has published two opinion pieces from non-Anglo Saxons. I commend Dev Nadkarni for venturing into Pakistan, to where the Mumbai terrorism has been traced. Terrorism could spell disaster for its fragile democracy. But I was saddened by the views of Irfan Yusuf, who yet again bashed the so-called Hindu terrorists, ignoring the real terrorists. He is an apologist for the Pakistani terrorists who shot some 200 people in cold blood and who were indoctrinated with hate by those associated with a religion that is supposed to preach peace. There was not a word from Yusuf on the cold-blooded murder carried out by brainwashed young people. It would greatly contribute to world peace if Muslim writers used their energy to stop the brainwashing of their brethren, who carry out mayhem that hurts peace-loving Muslims, rather than justifying terrorism by enumerating the supposed faults of the victims. I guess Mr Singh also regards the Maharashtra Anti-Terrorism Squad leaders to be apologists for Pakistani terrorists.